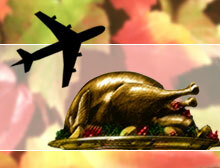 The airline guys just want to say HAPPY THANKSGIVING to you all. May you enjoy the holiday spent with friend, family and loved ones. Safe travels to all! We want to hear about your Thanksgiving travel adventures, pat-downs at security, airline customer service, whatever you’d like to tell us that’s interesting, fun or funny! Tell it!